Last month I had the honor of speaking on a panel organized by The Arts Community Alliance (TACA) in Dallas, hosted by the Nasher Sculpture Center. Every year TACA brings together speakers for Perforum: a Conversation to Advance Arts and Culture. 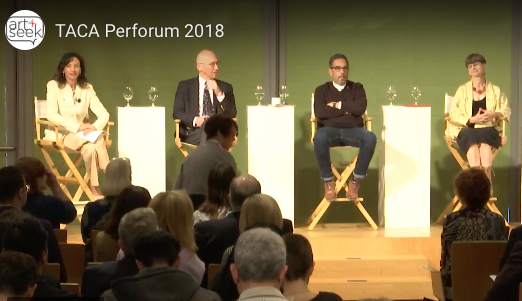 This year’s Perforum examined how arts organizations can meet community needs. In today’s post I’m sharing a (lightly edited) transcript of the remarks I made. The embedded video at the bottom of the post is queued to start on my bit, but I encourage you to listen from the beginning as moderator Zannie Voss interviews Carlos Contreras, Director of Marketing and Innovation, City of Albuquerque; Jon Hinojosa, Artistic & Executive Director, SAY Sí San Antonio; Ken Tabachnik, Executive Director, Merce Cunningham Trust in NYC. They shared fascinating and compelling stories of their work with their communities, and it is well viewing. As a futurist, what I’m doing is looking at what’s going on the world the trends that are shaping society and technology, the political trends, what’s happening out in the world and the ecological and economic trends, and I’m trying to see how that influences the opportunities for museums to do more good in their communities. So, for example, later this week I’ll be in Miami, and if you are a museum in Miami you might look at two trends: one, you might look at the increase in wealth inequality, and two, you might look at rising tides due to climate change and you might notice that Miami is facing a future in which they are worried about what’s being called “climate gentrification”. So you have property developers looking at formerly affordable diverse socio-economic neighborhoods and saying, “You know in twenty or thirty years that might be the new coastline, that’s going to be the hot coastal property maybe we should buy that up.” And it’s forcing people out of communities that their parents and grandparents had lived in for generations. Whereas the “outies” tend to be formed by people who said “You know that’s something we need to help with, let’s go, solve that through [creating] a museum.” I think this is a great strategy. As an example, in the 1970s there was a big wave of founding children’s museums, a lot of them by people in the Junior League, who said there’s a need for early childhood development and good out of school experiences, and socialization, and enrichment, children’s museums are a good way to do that. [For this reason] you had a lot of children’s’ museums start around then. Now, there are also museum “innies” that can change to “outies,” without radical plastic surgery. It’s a good thing too, because if you look at data from the Survey of Public Participation in the Arts, you’ll see that over the past few decades involvement in traditional forms of art– museums or symphony orchestras or opera–that has been a slow and steady decline. If you look at the arts writ large, there’s been robust participation in more informal forms of art, salsa dancing, poetry slams, making rather than just watching, because a lot of people are taking up craft and arts themselves. Which is great, but it doesn’t reassure the museums who have their attendance going down. We just got the the last round of the survey of Public Participation in the Arts and for the first time since they started doing it, which was, I think in 2002, we’re seeing an uptick. I think it’s because more museums, many of which started as “innies,” are becoming “outies” through applying a number of strategies, and I’m going tell you a little bit about four of those strategies today. One strategy is sharing authority, one is responding in real time to the events of the world around us, one is realizing that museums are inherently not neutral, and the fourth is the beginning to tackle the difficult work of decolonizing our practice as museums. Look at sharing authority. This is a trend that’s driven in part by an underlying technology, the fact that we now have lots of ways to communicate very personally and immediately with people who come to museums, it’s not just they come in, they hear a lecture, they read a wall label. They have a phone in their pocket you can be talking to them over twitter, you can be listening to what they are saying on social media, you can invite them to contribute their opinions. For example back in 2008, you had the Brooklyn Museum of Art creating what I believe was the first crowdsourced photography exhibit, called Click. They put a call out and said, “What are the photos you like of your neighborhood, of this community?” And then people voted on their favorites and they did an exhibit. You had in 2013, the Chicago History Museum saying to the community, “Hey we’re your museum. We’re about the history of Chicago what do you think the next big exhibit we do should be about?” They held a crowdsourced competition for topics, and then people voted on their favorite, and they now have the next major exhibit which opened in 2015, permanent exhibit, called “Chicago Authored” about the authors who originated in Chicago. Which, I have to say, is not the exhibit I would have thought the public chose, so that was kinda cool. Also in a very real but even deeper sense it’s reflecting a movement and approach that started in the 1990s, in the disability rights community which is sometimes called, “Nothing About Us Without Us.” It’s a shift not only to two way communication but sharing of authority, saying we’re not just talking about you—If you’re part of the story, you should be telling the story as well. That’s a process that is playing out in a lot of meaningful ways especially with some new museums that are beginning to tell the stories of previously unvoiced populations. The second thing that has been shaped and enabled by changes in culture and technology is the speed of the news cycle. It’s traditional in museums that a major exhibit can take 10 years to plan and put up. That’s great and it can be beautiful and very nuanced and deep. But if you’re on a ten-year cycle, you’re not really speaking to people about what happened in their neighborhood last year or yesterday. In 2014, when Michael Brown was shot in Ferguson, Missouri, the Missouri History Museum opened up to the city for a community forum to start processing the aftermath of that terrible event. In 2016, when Keith Lamont Scott was shot and killed by a police officer in Charlotte, NC, that was on Tuesday, September 20th, by Thursday night the Levine Museum of the New South had opened itself for a community forum talking about the shooting. And they took an exhibit they’d already been working on that was going to take them 3 years to put up, it was called, “K(no)w Justice, K(no)w Peace,” snd they had it up in 3 months because they knew the community needed that as a place to talk about and process these terrible events. Being willing to go and jump into a messy and hard conversation and say, “We may not get it right, we don’t have the wisdom of reflection over time to say this is what happened.” But to say, “We know we can help now with what is happening,” was a very profound shift. I think that a necessary adjunct to that has been the realization that museums are in fact not neutral in their positions. This is something that really gives museums anxiety attacks. When they’re faced with the ability to tackle a topic some people may say, “Well can we do that or is that taking a position?” It’s kind of freeing to realize that the neutrality was an illusion to begin with. Every choice that went into making that museum, the things that you collected the place that you sited it, the people who were on the board of trustees, the people that you hired, the language that you used in the wall labels, those weren’t neutral, they merely were so deeply embedded in the worldview of who those people were that they didn’t see it as being a point of view. Being able to back up and realize that, I think frees museums to say “No, let’s make conscious choices, let’s be aware of what position we’re taking” and sometimes that requires being brave. Then you also have museums going back and saying “These are complicated histories of race and power as well.” For example the Worcester Art Museum went and looked at their American art galleries with all of these beautiful portraits of men and women in their fine clothes, carefully posed, and they said “You know, there’s so much unspoken that’s reflected in those portraits.The society and the economic system that gave those people the wealth to be able to dress like that and commission a portrait. The people who are not shown in most of the portraits who did the work behind the scenes.” So they went through a process of adding wall labels, they didn’t take away the original ones, they said “Let us tell you a little bit about the history of these people,” and many of them were slave-owners or made their wealth in industries that benefitted from slave labor. It’s surfacing those hidden histories and adding the facts to give people a more well-rounded view of the world because those portraits are a very narrow window and unless you help them look through the window into the world reflected behind it then they only see the surface.